They say that life begins at 40, which frankly is a little bit too Benjamin Button for comfort. It’s also not true, clearly. Even if you can reasonably expect to make it to 80, up from a short and not especially sweet 25 in medieval times, your fifth decade is middle age at best; you’re summiting the hill, if not over it. The only salad days you’re going to enjoy now are if you go on the 5:2 diet. That means though that it’s all downhill from here – in a good way. You’ve established yourself and your personal style. You don’t have to follow fashion. And even though you’re at peak earning power, you don’t really need to buy anything, so you can conceivably fork out for fripperies like bespoke suits and high-end watches – especially if you’re no longer paying through the nostril for full-time childcare. Life might not begin at 40, but as far as your style is concerned, it doesn’t have to end there either. Browse Italian brands like Boglioli, then lace up your John Lobbs – or throw on some sleek trainers. The danger when out of office meanwhile is that you slip into dadwear – and not the ironic, fashionable kind. “Teaming elements of tailoring such as an unstructured blazer with chinos or jeans retains a subtle edge, and you can keep it casual with a T-shirt,” says Arnold, who also advocates cargo trousers as a fresh alternative to denim: “With a suede bomber, sweatshirt and sneakers, they’ll nail a comfortable but refined weekend look.” Not DIY. The mention of cargos – rightly maligned in their voluminous, Fred Durst-endorsed form, but totally acceptable if they’re actually the right size – is an opportune moment to reiterate that one of the chief factors in differentiating between stylish, undistinguished and downright slobbish is fit. And that goes for your physique as much as what you attempt to obscure it with. We’ve said this before but it bears repeating: staying trim helps. A lot. When the rest of your rig is resolutely low key, accessories really come into their own. Arnold recommends bringing in colour, pattern and a little texture in your accessories. Think knitted ties or patterned silk scarves. Other finishing touches such as leather gloves and matching luggage make a difference, but the big-ticket item is a luxury watch. “You’ve worked hard for 20 years now – you deserve it,” says Arnold who likes Piaget and IWC Schaffhausen. “I don’t believe there are any strict rules,” says Arnold of playing on in athletic-inspired kit into your fifth decade. But hoodies, backpacks and baseball caps have an undeniable juvenility that can jar with your veteran status. If you’re sporting sweats or joggers, then they should be quality, plain versions – maybe even in a fabric other than jersey; your trainers should be minimalist. Like most sporting success though, a lot depends on fitness. Don’t be tempted to dye your hair. Yes, it might look vaguely convincing now, but then you’re trapped in a cycle of regular, expensive maintenance until the point at which it fools nobody except yourself. Then your choice is between dying it ever greyer or pretending that you’ve suffered a terrible trauma and turned white overnight. If you’re balding, reach for the clippers. And any talk of botox or facelifts will draw a raised eyebrow from us. Having filled out your tailoring wardrobe in your twenties and upgraded it in your thirties, you’re at the age, earning bracket and settled body shape to commission. A bespoke suit should last a good 20 years if cared for properly (brush frequently, dry clean rarely), so although it’s a chunk of change, it should hopefully see you all the way through to retirement. While the grandad connotations of cardigans are overstated, knitwear comes over more grown-up (and smart-casual) with jeans and a T-shirt than a sweatshirt or hoodie. And if your offspring have stopped indiscriminately vomiting and defecating by now, then you could even consider treating yo’ self to some cashmere. If you’ve already grasped the need for a holdall for weekday gym trips and weekend city breaks, then check the rest of your baggage is excessively nice and coordinated: a long-haul suitcase, a cabin-sized wheelie case for short trips, and maybe a carry-on tote or suit bag. Real men don’t get the earth to help carry their luggage, but wise, old ones with dodgy backs do. Tell the kids that you’ll pass it on when they graduate – or you pass away. Fragrances can be age (in)appropriate as much as garments. Where new releases tend to stick to a generic citrus-wood-amber template and smell more synthetic than a replicant’s hairpiece, sophisticated scents will often have a suitably retro vibe, if not an issue date that predates yours. And a hint of leatheriness to your skin is no bad thing here. More suited and less booted since his retirement from football, David Beckham’s style nevertheless continues to contravene the rule about not wearing sportswear (and indeed streetwear) into your fifth decade. But the fact that the sprightly 42-year-old looks like he could still do a job on the right wing grants him extra time. Don’t bend it unless you can compete. Pristine, slightly preppy tailoring and a youthful approach to streetwear is what separates the hip-hop artist from most commoners his age. One of the big reasons the 45-year-old gets away with it is real attention to detail when it comes to grooming. Like Beckham, Common understands that good skin – and hair care – is a free pass to wearing styles most men in their 40s think they’ve grown out of. Schooling the philistines of the English game with his unconventional touchline attire and tactical innovations alike, “Don Perfecto” – as the Man City manager was nicknamed at Barcelona’s academy – takes as much care with his outfits as his line-ups. Although he should drop the belt when wearing a suit – especially when it’s that tight. Granted, it’s perhaps easier to look perpetually dapper when you’re the owner of Savile Row tailor Norton & Sons and creative director of catwalk brand E. Tautz. But aside from his repertoire of navy and grey tailoring that would be the envy of any Kingsman, “P Greezy” is also testimony to the power of a good, regular haircut and beard trim. The man loves a wide-leg trouser, too. Van Wilder has matured a lot since his party liaison days. Witness his range of classic pieces in a muted colour scheme, from red carpet-ready three-piece suits to an olive overshirt and khakis. Whether he’s flexing in a tux or relaxing in a tee, everything fits his gym-honed Deadpool-bod like a custom glove, so the father of two never looks like a deadbeat dad. Your skin gets paler and thinner as you age, so brights, pastels and some neutrals may wash you out. 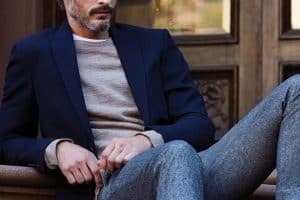 That doesn’t mean you have to wear exclusively navy and grey (too much too-dark can do the same): just warmer shades like sand or camel instead of beige or stone. The onset of middle age can do strange things to a man’s mind. But trying to be overly adventurous in your later years is more regrettable than Indiana Jones And The Kingdom Of The Crystal Skull. That leather biker jacket is a poorly chosen false grail. As is that hog. If it hasn’t been adjusted then it doesn’t touch skin. You should have known your tailor for longer than you have some of your friends. And you should see your barber more often than most of them – every four weeks. A manicured coiff will take years – and pounds – off. The only part of your wardrobe that should resemble Eminem’s is the inside. Some things to ditch: slogan or logo T-shirts, heavily ripped or distressed jeans, hype trainers, ironic watches, skinny tailoring. Donate them to your nearest charity shop. Or your 12-year-old son. Ryan Reynolds is 40. Jason Statham is 50. Both of them have appeared on the cover of Men’s Health recently. The bar for what a middle-aged man looks like, and is capable of, is being raised, for reps. You’re only as old as the Hollywood actor whose workout you do.